PMVR: My favorite panorama viewer is called PMVR because it produces tours with an integrated map feature (view example), is incredibly fast, even viewing large panoramas, and the viewer works well even on older slower computers. 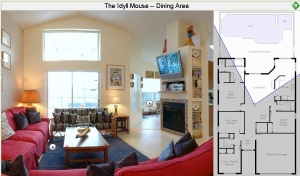 Plus it comes with free, easy to use GUI-based virtual tour authoring software. Full Screen Mode: PMVR also has a fast full screen mode, which really shows off your panoramas -- especially if you have taken the time to produce high resolution, high quality panaoramas. Authoring Tool: PMVR comes with a GUI based virtual tour authoring tool called Virtual Tour Editor, which allows you to easily create tours with maps, multiple panoramas -- all with hotspots. Just import your panoramas and you have an instant virtual tour!